This circular walk is just a little under 6 miles incorporating two idyllic villages, quiet country lanes, pleasant woodland, open countryside and an interesting church at Hellidon. A small section of the walk crosses Hellidon Lakes Golf Course, so extra care should be taken near the fairways. 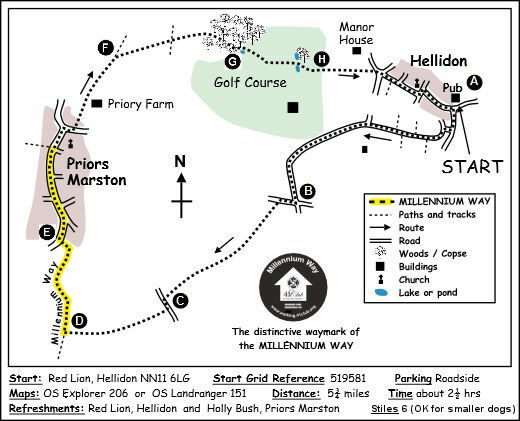 The walk starts and finishes at The Red Lion Inn at Hellidon where walkers and dogs are very welcome, but refreshment can also be obtained half way round at The Holly Bush in Priors Marston. There are no difficult sections on this walk and only six stiles. It includes a short section of The Millennium Way at Priors Marston, which is clearly waymarked with the distinctive black and white circular waymarkers. Find out more about the walk by clicking on the information icon. A. 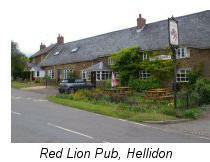 We start our walk from The Red Lion Inn at Hellidon ( currently closed. ) With your back to the pub go up road directly opposite the front of the pub signposted Priors Marston 2 miles. After approx 100yds take the lane on the right and follow lane around to the left, signposted Priors Marston and Southam. Ignore footpath on left near the bend and continue ahead along the lane past the T-junction. (On your right you have some splendid views past Canning's Spinney to the north). Pass the entrance to Hellidon Lakes Hotel and Golf Course and continue along lane until you reach the crossroads. B. Turn right at crossroads and after 100 yds take stile and footpath left to go ½ right across field keeping the communication towers to your far left. 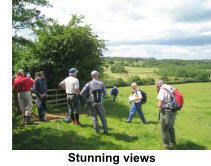 As you descend down the field you can enjoy an attractive panorama of open countryside ahead. Go through narrow waymarked hedge gap and continue down field keeping low broken hedge left.Go past the spinney on left to corner then stay straight ahead across open field through gap to right of two trees into next field. Keep ahead until you reach the road. C. Turn left on road for approx 70 paces then take waymarked footpath right along the track at the end of which take a stile into field and continue ¼ right towards corner of copse to take the gap into next field keeping fenced hedge and small lake on your left. Go through the two gates ahead and turn immediately right keeping hedge right. D. Here you have joined The Millennium Way. Continue with hedge right and follow hedge as it curves left and you will come to a stile which sticks into the field (there may be a temporary fence here). Go over or past the stile and after approx 100 yards, go past metal gate then a few paces further on take stile right and then go through metal gate. Continue straight for 20 yards keeping hedge right and grassy mound left and after passing the bush at the end of the grassy mound go half left across the field (or skirt around if horses are contained by electric fence) to take footbridge through hedge and over stream. Keep ahead with house left and after approx 100yds take stile left to track and then driveway to reach road. E. Turn right on road (you are now entering the village of Priors Marston) and on reaching the T-junction bear left up road to pass the Priors Marston War Memorial on right and where the road divides take the right fork signposted Lower Shuckburgh and Napton. Continue along Shuckburgh Road passing telephone box on left and continuing past School Lane, St Leonards Close and Vicarage Lane on right. On reaching a red pillar box (we leave The Millennium Way here) continue to next junction and turn right up lane and after 50 yds take lane left, into the second Keys Lane (with a list of named cottages on the sign.) This second lane is waymarked. Stay ahead to the end of the lane which eventually swings left and take gate to follow footpath under power lines across next field. Take next gate and cross farm track to go through another gate then continue ahead through small copse. Take metal kissing gate ahead and follow footpath half right across field. F. Go through gap ahead to cross small plank footbridge and continue directly ahead across centre of next field. Go through large five bar gate ahead then immediately leave cinder track to continue on previous line towards wood following direction of the yellow waymarker on solitary waypost. Be sure to maintain a straight line towards centre of wood to find a narrow gap (with large black & white waymarker - which is a little difficult to see from a distance) to enter wood. Go along well defined path through wood following signs, eventually to emerge on to the golf course after a small pond on right. G. At the edge of the golf course follow the waymark sign and go half right across the first fairway uphill towards a copse of trees and pass to the right of a clump of small trees which contains another waymark sign. Enter the copse of trees following another black & white waymark sign and emerge at the other side of the copse to meet another fairway. At this point go half right across the fairway keeping three trees on the fairway to your left to find a mid-hedge wooden footbridge. Cross the footbridge and walk straight on across the fairway aiming to the left of the green ahead and directly to the tee for Hole 4. Continue past the tee for Hole 4 and walk on between the two lakes and immediately turn right before the trees keeping the lake right and the trees left. Continue ahead keeping close to wooded area on your left to cross next fairway to reach another waymarker post just beyond the green. Descend steeply through small copse crossing wooden plank bridge, then go over gap stile into field. H. Go ¼ right up the field to find top right corner kissing gate (ignore first wooden kissing gate right, 2/3rds up the field). Take the corner gate and continue along edge of field with hedge left to take next kissing gate then follow path round with fence left to emerge onto road. Go left for 50 yds then right and continue down Church Lane, passing Berry Lane and Cox's Lane. After passing St. John the Baptist Church immediately take a left turn into Little Back Lane and walk about 75 yds to a T - Junction opposite a red telephone box. Turn right passing the Old Mill House on your right to walk up the lane which will bring you back to your starting point at The Red Lion Inn. Hellidon is a charming village with an industrial past. Until the 1950’s it was a centre of ironstone quarrying, Hellidon Lakes being a legacy of that activity. An industrial railway connected to the Great Central line at Charwelton. Its population reached 449 in 1861, but today is around 200. 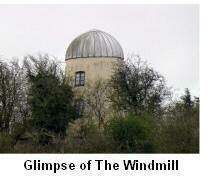 Now the area is home to several vineyards, the most notable being the Windmill Vineyard with its distinctive silver-capped mill at Windmill Hill Farm. Walking out of the village, the Lakes, country club, hotel and golf centre can be seen to the north. 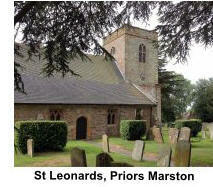 The village originally belonged to St. Mary’s Priory, Coventry, hence the ‘Priors’. The ‘Marston’ comes from Old English ‘merse’ or lake and ‘tun’ meaning settlement. The ‘merse’ was a fishery which served the village. The primary school was one of the first ‘free’ schools to be established, state funded but independently managed. Local children attend free whereas pupils from outside the local catchment pay fees. The church is largely a Victorian rebuilding from 1863. The Hollybush, a 16th century inn with an excellent restaurant, can provide refreshment if needed. The remoteness of the village meant that it only received a mains supply of electricity in 1934 and of water in 1948. The village is set on the very ancient Ridgeway track, an Iron Age trading route locally linking Nadbury Camp Edgehill to Arbury Camp at Catesley. The Salt (Welsh) Road dating from at least the Roman occupation links Droitwich to Northampton and was used to carry salt for meat preservation and general trading. It runs across the centre of the Parish east to west. Returning via the golf course to Hellidon, the church of St. John the Baptist is passed, a medieval building in the Gothic Early English style. The end of the walk is the Red Lion, another traditional village inn.